Intel has unveiled a new microchip that shows less can be more. The chip firm has shown what is thought to be the first working chip using transistors with features just 22nm (billionths of a metre) across. Shrinking these basic building blocks of chips will, in theory, make them faster and more efficient. The chip contains nearly three billion transistors packed into an area the size of a fingernail, but Intel says there could be smaller to come. The development shows there is still life in Moore's Law, which states the number of transistors it is possible to pack on a silicon chip for a fixed cost will double every two years. Generally speaking the smaller the chip's geometry, the faster and more power efficient the chip. "Moore's Law is not a law of physics, it's a law of human inventiveness," Intel president and chief executive Paul Otellini told BBC News. "There is nothing that says that humans can't continue to invent." 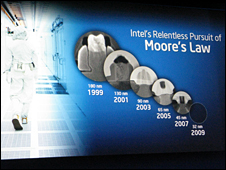 Intel is currently making chips based on 45 nanometre technology and will move to 32 nanometre later this year. The company's first chips in the 1970s had just a few thousand transistors. IBM and a European project called Duallogic are also involved in creating 22 nanometre chips. 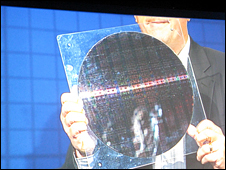 Mr Otellini displayed the silicon wafer during his keynote speech at the firm's developer conference in San Francisco. He revealed that it contained 364 million bits of memory and has more than 2.9 billion transistors. It is expected to go into production in 2011. "We have at least four generations of what we are shipping today in development. That is as far out as we have ever been able to develop things. "Not everything is done but it gets harder for sure. It requires more invention and more money and it's our job to continue that pace," said Mr Otellini. 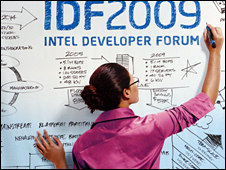 Those attending Intel Developer Forum, IDF, were impressed by what they saw. "I believe we are always going to be able to improve on Moore's Law," said Professor Tom Murphy from Contra Costa College. "It's always delightful to see the vision of what Intel is planning because it translates to the toys I will get to play with real soon." Haider Sabri from techSpeak said: "I was starting to have doubts that Moore's Law was valid anymore, but thankfully I have been proven wrong today." Meanwhile Matthew Wolf, a research scientist from Georgia Tech, said he could not help thinking the end for Moore's Law had to come eventually. "I am coming at this as a physicist and it just had to end sometime. But I think that the trajectory for the next few years is clearly one that is real and on its way," said Mr Wolf. During his speech, Mr Otellini also predicted that the worldwide personal computer market was due for a resurgence and could actually defy predictions by growing this year. "In general, technology was the first into the recession and is likely to be the first out. We have seen this in past recessions and so far the pattern seems to be holding to that. "The computer has become so indispensable that if it breaks you don't wait for the recession to buy a new one. You are going to go out and get another because it is simply a part of your life," said Mr Otellini. The optimism displayed by Intel's boss goes against the grain given recent studies done by research companies IDC and Gartner. Both have predicted that PC shipments will decline year-over-year in 2009, representing the first drop since 2001. Researchers at Gartner point to a 2% decline this year, which is an improvement on the 6% drop the company was projecting a few months ago. "Things are looking much better in the second half," Gartner research director George Shiffler told Cnet.com. "It wouldn't surprise me if we did see positive growth, but that's not our call at the moment. I think that's more of a best-case scenario," said Mr Shiffler.